You can battle trainers at the Battle Tree. When you first arrive at the Battle Tree, you can battle with either Red or Blue. After every 10 battles at the Battle Tree Super Single, Super Double, and Super Multi; there is a chance of encountering him. The following Pokemon that will be used by Pokemon Trainer Grimsley will be chosen at random. Since no two Pokemon of the same species may enter, only one of the two possible Held Item and move sets will be chosen. 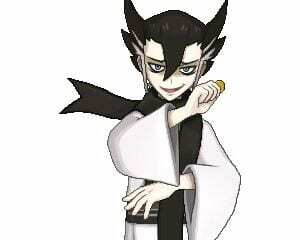 By observation, Grimsley’s roster Pokemon share the same typing (aka Mono-Type Team), with all of them capitalizing on dark-type alone which allow Fighting types and Fairy-Types to be optimal choices to join the fray. Keep in mind however that the following items: Focus Sash and Chople Berry are to be expected in some of his Pokemon which can prevent yours from scoring a knock out. In addition to the above mentioned types to bring, majority of Grimsley’s roster also share a striking similarity in terms of partial Ground-Type weakness through: Houndoom’s Fire-Typing, Tyranitar’s Rock-Typing, Drapion’s Poison-Typing, and Bisharp’s Steel-Typing. This makes having some Ground-Types or Ground-type moves equally effective against them, only falling short of Honchkrow’s Flying-Typing. In terms of Pokemon to bring, Garchomp makes a great contender when equipped with the item Lum Berry and having one of its moves as Substitute, as it allows it to both scout and avoid crippling moves then follow up by possibly taking-out one or two before its Substitute wears off. In addition, aiming for a sweep away with Mega Gyarados that has buffed with Dragon Dance is also effective. As mentioned above, a recommended durable Fairy-Type is Azumarill as it also possesses a Water-Typing which patches up its Steel-Type weakness. With a great STAB priority move through Aqua Jet, it negates Bisharp’s held item Focus Sash’s activation, and decreases its move Metal Burst’s effectiveness allowing Azumarill to successfully defeat it.